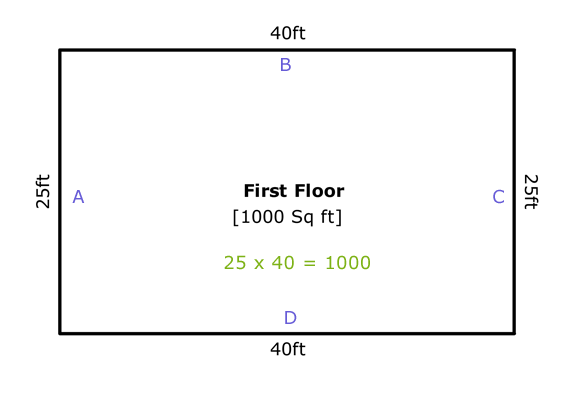 Determining the Square Footage of a House: Easy or Not So Much? The square footage of a house can be straight-forward to calculate, or it can be a complicated series of steps better left to a professional. Difficult largely lies in the shape of the property, as well as the internal architecture – open spaces, for example, that can complicate how to measure a house. In this series of posts, we will take you from the most basic examples of how to measure an house, up to the point where it becomes impractical to determine square footage without the use of specialized tools. For a list of things that count, and things that don’t, when calculating square footage of a home, please read the second part of this series, Square Footage of a House – Part 2 of 3. Scroll down to the bottom of that article for details. Does Measuring a House Sound Easy? 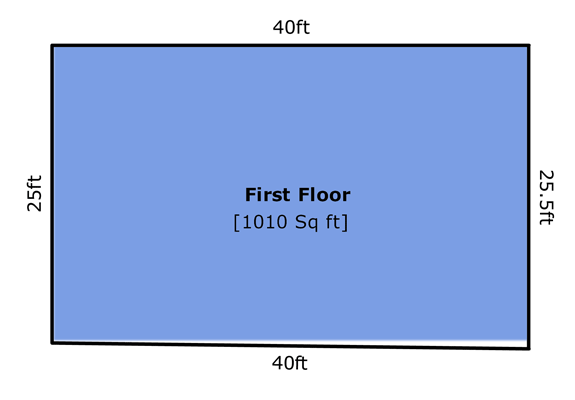 So determining the square footage of a house sounds easy, right? Um, not really! Even when a house is relatively easy to measure (for example, a rectangular, single-story house without a garage), it can be tedious and pretty easy to get your numbers mixed up. Because we measure every house for every appraisal, we use specialized tools that make determining the square footage of a house easier. A Leica Geosystems DISTO Laser Distance Meter laser distancemeter, whenever possible to reduce errors associated with measurements taken manually with a measuring tape (even the specialized appraisers measuring tape). Sketching software that is fully integrated into the appraisal software platform we use from a la mode. So, you now know the basic steps, and that we use specialized tools to make this easier. At an absolute minimum, you will need a measuring tape (a LONG one), a notepad, a pencil and a calculator. Since you already know the house is a plain rectangle, go ahead and sketch out a rectangle on your notepad. Start at one corner and measure from your starting corner to the next corner and write down the measurement (this first side you measured you can label Side A). Make sure you write down the feet + inches from your measuring tape. For example, if the house is 25 feet and 3 inches long, you don’t want to round down to 25 feet because you won’t end up with the right dimensions for the entire house. Continue around the house in one direction, measuring corner to corner, writing down your measurements as you go. You will measure all four sides, and will end up back at the same corner where you started. The square footage of this house is simply Length x Width. Side A should have measured the same as Side C, and Side B should have measured the same as Side D. If they are more than 3 inches different, you should re-measure (most houses aren’t perfectly even, but more than a few inches suggests more wonky measuring than wonky house). Make sure you convert to inches before you multiply Length x Width, and then divide by 144 to convert back to feet. In this case, we left our measurements in feet (25 feet and 40 feet) because the walls measured in increments of full feet. This single-story house is 1000 square feet. No adjustments to the size were necessary because all of the space inside the house counts as interior living space. In this case, the left-hand wall is .5 feet, or 6 inches, longer than the right wall of the house. We can still see that the area colored by the rectangle, which is a 25×40 foot rectangle, is 1000 square feet. The little bitty sliver of white space at the lower right side of the diagram is the extra space we need an additional calculation for – the area of this triangle which is 40 feet long on one edge, and .5 feet long on another, with a right angle in between. The area of this single-story slightly wonky house is 1010 square feet. The longer wall made a 1% difference in the overall size of the home. Getting the Hang of Measuring a House? In the next posts of this three-part series, we’ll discuss how to determine the square footage of houses with more complicated floorplans (yet, still simple ones). We will also provide a list of common elements that are and are not included when calculating the interior living space of a home.